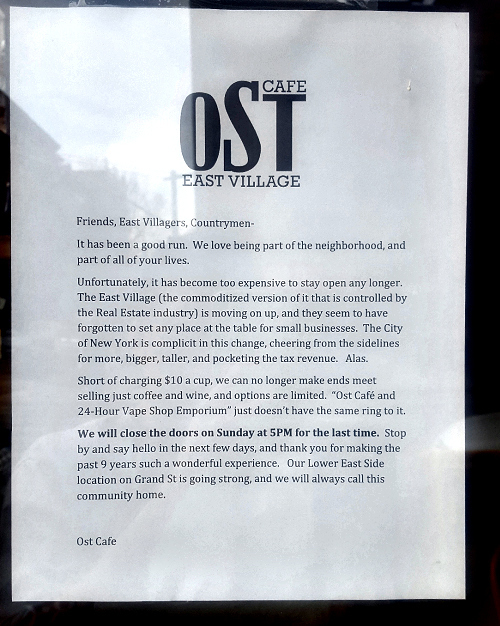 Ost cafe’s last day in the East Village/Alphabet City will be Sunday, February 26th, 2017 according to a note that was posted on their window today. Friends, East Villagers, Countrymen- It has been a good run. We love being part of the neighborhood, and part of all of your lives. Unfortunately, it has become too expensive to stay open any longer. 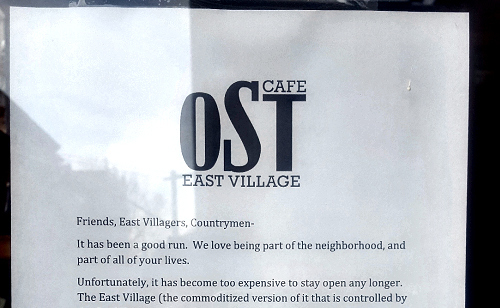 The East Village (the commoditized version of it that is controlled by the Real Estate industry) is moving on up, and they seem to have forgotten to set any place at the table for small businesses. The City of New York is complicit in this change, cheering from the sidelines for more, bigger, taller, and pocketing the tax revenue. Alas. Short of charging $10 a cup, we can no longer make ends meet selling just coffee and wine, and options are limited. “ost Café and 24-Hour Vape Shop Emporium” just doesn’t have the same ring to it. The cafe has been at its current Avenue A location for 9 years. As mentioned in their note, their Lower East Side location will stay open.